Dog – Under the influence! The British Isles are rich in history and tradition and there are many strange and wonderful legends gathered from folklore whose origins are lost in the mists of time. From these mists there have emerged many folk tales of spectral animals with strange and terrible powers that are said to haunt the forests, hills and remote byways of this ancient land. 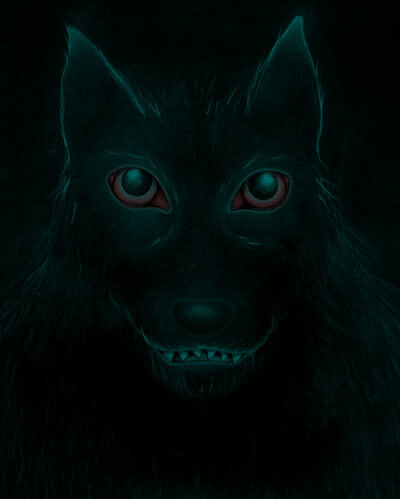 Perhaps one of the most terrifying of these is the legend of the Black Dog. Black Dog – Author: Liza Phoenix – Creative Commons Attribution 3.0 Unported license. 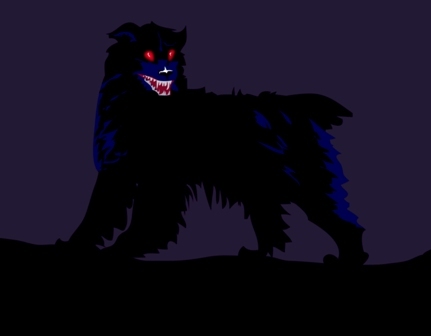 Sightings of phantom Black Dogs have been recorded from many parts of Britain for many centuries, with encounters in England seeming to be the most prevalent. Most of the English counties report incidents and sighting of these mysterious beasts which are known by many names, depending on location. In East Anglia the beast is often known as Black Shuck where it has haunted the countryside even before the arrival of the Vikings. In Scotland there is the Cu Sith and in Tring, Hertfordshire, the Lean Dog and in other parts of England there is the Church, or Kirk, Grim and many other names. One of the most frightening incidents ever reported took place in the quiet market town of Bungay, in Suffolk. On the Sunday morning of the 4th of August, 1577, during the Morning Service at St. Mary’s Church a terrible and violent storm broke out. The sky darkened, thunder crashed and rain fell heavily from the skies. Lightning flashed wildly as the storm broke upon the church. Inside the congregation knelt to pray. Suddenly to the horror of the congregation from out of a flash of lightning there appeared in the church a huge and monstrous Black Dog. Howling wildly as the lightning flashed and thunder pealed, the beast ran amok attacking the terrified parishioners and causing havoc. Two people at their prayers were killed and a third man was badly burned from being mauled by the beast, but did survived the ordeal. There was great damage inflicted upon the church, as the tower was struck by lightning and the clock destroyed, before the Black Dog finally ran wildly from the church to the relief of the petrified congregation. 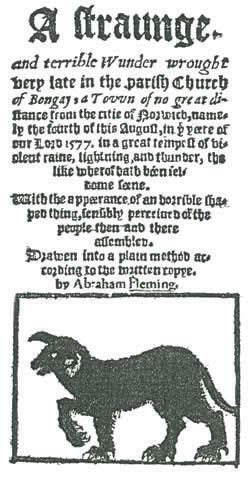 Around twelve miles away in the Holy Trinity Church at Blythburgh, at a about the same time the Black Dog, or another beast like it, appeared and also attacked the frightened congregation at prayers killing three people. There are scorched scratch marks on the church door that can still be seen to this day. In the Hertfordshire town of Tring a phantom with red, glowing, eyes and known as the Lean Dog is said to haunt the site where a gallows once stood. In 1751 an old woman was accused of witchcraft by locals and drowned. A local chimney sweep was accused of taking part in her murder and was hanged from the gallows. In the 19th century two men who encountered the Lean Dog reported it as being gaunt, haggard and unkempt. A local schoolmaster who encountered it reported it to being about the size of a Newfoundland dog with a shaggy coat and tail and long ears. There are also reports that state that with its first appearances it materialize as, or from, a fiery torch. In Scottish and Irish legend the Cu Sìth, which means ‘fairy dog,’ was said to have a dark-green, shaggy coat and to be about the size of a large calf. Its eyes were large and had a fiery glow and its tail was curled and sometimes braided. In Celtic tradition phantom dogs are usually black though sometimes they are white but have red ears. The Irish Cu Sith is describe as being a huge black hound. Green is associated with ‘fairies’ in Celtic lore and it is named the ‘fairy dog’ and seems to be in league with them. The Cu Sith was feared as a harbinger of death. In much the same way the Grim Reaper appears at death to lead the soul to the afterlife, so the Cu Sith takes the soul to the underworld. The hound is said to have hunted silently for its victim but would sometimes rend the air with three blood-curdling yowls that carried for a great distance. When this was heard men would lock up their women to prevent the Cu Sith from stealing them and taking them to the fairy world where they would be made to give up their milk to the children of the fairies. The Vikings brought many of their customs and traditions to England from Scandinavia and may well have influenced the legends of the Black Dog. The Church Grim was also known as Kirk Grim and in Finnish, ‘Kirkonväki’ and in Swedish, ‘Kyrkogrim.’ Both appear in English and Scandinavian folklore as sentinel spirits whose task was to protect a church and its grounds. They could appear as small, dark, grotesquely formed people, or as a Black Dog. In many parts of Europe, including Britain, early Christians are believed to have sacrificed animals when a new church was built. A black dog would be buried alive on the north side of the land which would then become the guardian spirit keeping the church and grounds safe from the devil. It was often regarded as a herald of doom bringing death to anyone who encountered it. In ancient times Galley Hill was home to a hill fort and barrow. Later in 16th-and 17th century it became a place of execution and a gallows was erected. Galley Hill is a highly visible landmark where witches and criminals were executed there and their bodies covered in tar to preserve them. They were then left to hang on the gallows which stood high on the hill as a warning to others before being eventually buried. It is reported that one night the hill was hit by a ferocious storm. The gallows were struck by lightning setting it and the ground around it on fire. In the flames a Black Dog was said to have been seen howling and capering wildly. People believe that the beast comes for the souls of criminals and witches driving them through the Gates of Hell for Satan. Sightings and encounters with Black Dogs are still reported though they seem less horrific than those of the past and in some cases even benevolent with the beast acting as a guardian or guide ensuring travellers arrive at their destination safely. Sometimes they have been reported by drivers who have seen them in their headlights in the road at night only to vanish when the vehicle is about to make contact. There are also reports from many other parts of the world about similar ghostly encounters which suggest that the Black Dog is not just a British phenomenon. 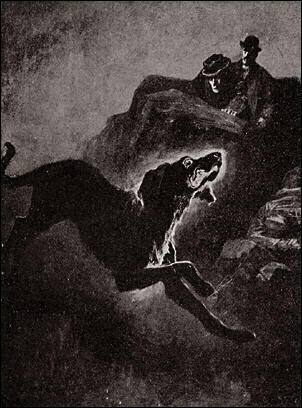 File:Blackdog.jpg from Wikipedia – Black Dog – Author: Liza Phoenix – Creative Commons Attribution 3.0 Unported license. The Moddey Dhoo of Peel Castle goes back at least to the reign of Charles the Second of England. In those days there were soldiers stationed at Peel Castle as guards. Just inside the main entrance was the guard room where the soldiers were posted to keep guard. From the guard room a passage led to an ancient church and through this to quarters of the Captain of the Guard. In the evening as night fell it was the duty of one the guards to lock the great castle gate and take the key down the passage to the Captain of the Guard. This duty was taken in turns and who ever locked the gate would be responsible to ensure the key was taken down through the darkness of the passage and placed into the Captain’s own hands, before returning back up the passage to the guard room. In the gray evenings after the gate was shut the soldiers would get together in the guard room and light a fire to dispel the cold and gloom. There, they would spend the evening drinking ale and telling stories. When the first sightings of a large black dog with a long, shaggy, unkempt coat were reported, some accounts said it was like a huge spaniel. No one knew who it belonged to, where it had come from, or how it got into the castle. Its presence was a complete mystery, always appearing after the gates were shut. Sometimes it would appear in one room, and at other times would be seen in different parts of the castle and grounds. Every evening after the fire was kindled in the guard room fireplace and as the cold and gloom began to dissipate the dog would be heard padding down the passage to enter the guard room. The huge creature ignored the frightened guards and making no sound lay by the fireside until dawn. Then just before the sun rose it would get up and pad into the passage and disappear until evening when it would reappear again. The dog is said to have had a supernatural appearance and although the guards were frightened of the beast they would ignore it. Instead of drinking and rebelling they would tend to keep sober and quiet so as not to disturb, keeping on their best behavior. However, now instead of one soldier taking the key to the Captain’s quarters, two would go. No one would walk along the black passage alone after the appearance of the dog. The legend tells that one night after the appearance of the dog one of the soldiers got drunk and boasted loudly that he would take the key down the passage to the Captain alone that night as he feared no dog, mortal or supernatural. Although it was not his turn to take the key and his fellow soldiers did their best to dissuade him, he would have none of it and set off into the blackness of the passage alone. To show his fellow soldiers his courage he taunted the beast, challenging it to follow if it dare. Although the other soldiers tried to hold him back the drunk would not be restrained and plunged into the passage with the keys, again challenging the dog to follow to see if it was mortal, or supernatural. The huge black beast slowly rose and followed him down the passage. Silence fell upon the castle like a black cloak and those who remained in the guard room huddled together in fear and would not follow the drunken soldier into the blackness of the passage. Time seemed to stand still, but after what could only have been a few minutes they heard the most deathly and terrible cries and screams coming from the passage, but none would leave the guard room to investigate, or give help. Shortly, from the passage they heard the staggered footsteps of someone struggling back towards them. The drunken soldier fell through the door into the room, his face white and twisted with fear, his eyes blazing in terror, his mind destroyed. From then on he uttered not another sound and he could not, or would not, tell what had befallen him. Three days later he was dead taking the secret of his ordeal to the grave. After that night the black dog was never again seen in the guardroom, passage, or anywhere else in Peel Castle. It certainly makes a good story! In many different places of the British Isles there are many legends of black dogs. Many have associations with Viking settlements and the Vikings built Peel Castle which is actually situated on St Patrick’s Isle and linked by causeway to the Isle of Man. In the Manx language ‘Mauthe Doog’ means ‘black dog’ and Moddey Dhoo is thought to be derived from this. In England and Scandinavia phantom black dogs are also strongly connected with early Christian church and graveyards where a black dog would be buried alive to protect the church and grounds from the devil. The passage from the guard room was said to have run through an ancient church. Intriguingly, an excavation in the castle grounds, in 1871, uncovered the remains of Simon, Bishop of Sodor and Man, who died in 1247. At his feet was found the skeleton of a large dog.